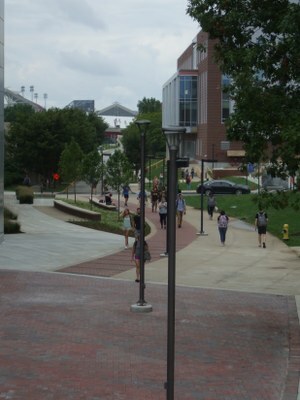 The Belknap Academic Building Pedestrian Plaza project got underway in January 2019. The creation of a drive that replaces Brook Street and maintains service access to the Northwest portion of the main campus has long been desired. The transformation of this portion of Brook Street from vehicle to pedestrian traffic is a major improvement to campus. The conflicts between service and other vehicles and bike and pedestrian traffic in this area has long been dangerous and inconvenient. The creation of a pedestrian plaza to replace Brook Street will be an amenity to the campus, allowing for new greenspace, storm water infiltration in one of the most flood-prone areas of campus, and a safe, convenient corridor for those on foot or bicycle. More details are outlined on page 3 here.